Hi, are people still getting any 100 bars for Potential and Speed? I've now gone through about 50 seasons over a few months, bought every single horse available, including every horse in the pre-season actions and I've not had 1 horse with 100% on either trait? Is this normal now? I've not played the new game yet, it's taken 2 days to put my 30 odd horses back in the CK, i've got a free weekend so hopefully i'll be able to do a little bit of breeding before I'm back away. I noticed the potential bar has gone up with the new patch but not as much as it was, my only 3yo with full potential has a full bar again but will it be able to give it out, i'll know later but the one thing i've noticed is the deterioration bar works on this game, when my horses hit 5 at the start of that season my horses started to lose their potential. It never happened in SO6. Oddest thing, not one 100% in allk that time, an the next horse i checked was an 8yo with 100% speed. Hopefully this breeds on as I have a lot of Filly's 95 speed. Ouyt of curiosity, what do you mean re-loading horses into the CK? 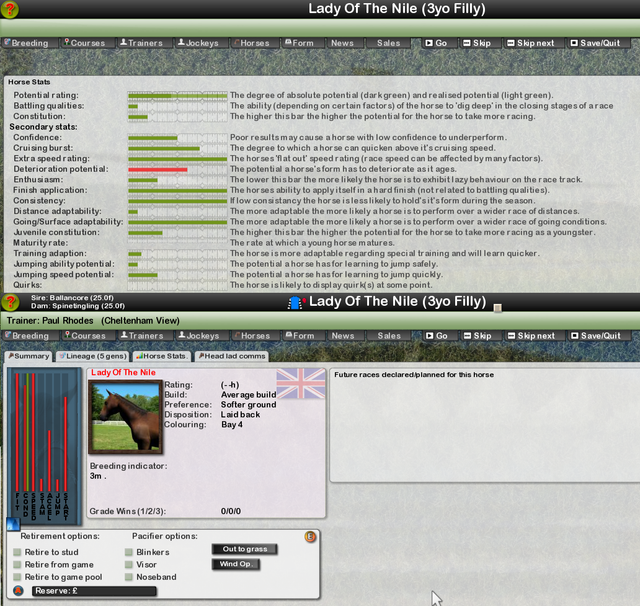 Well the one's that was bred using the last system their potential will be higher with mark changing it and if u not going to be a mass breeder then every horse counts, I don't have the time to play lots and so every horse counts but if u have the time then it's probably not worth it because u will soon bred better horses. I don't have the time these days to play both jumps and flat so my motto to SO7 is i'm going to play my US game and have whatever I end up with I end up with. To be up with the best u have to put in the time and so i'm going down the play game and have fun and enjoy it. Even if u start now I think if u want to be up with the best u can still catch up. one thing i've noticed is the deterioration bar works on this game, when my horses hit 5 at the start of that season my horses started to lose their potential. It never happened in SO6. It has happened to me occasionally in SO6 - mainly with game bred horses that I have bought from the weekly sales. Sometimes it passed on into my breeding but it only seems to last one generation and then it's gone. It seems a lot more prevalent in the horses and it looks like it will have more effect on the horses , I suppose it adds something different . I guess it might put more of an emphasis on 3 and 4yo's in the league for SO7? If you don't mind me asking what approach do you take to breeding in the game? I can't get anything above a 70 and those I buy from sales, don't breed them. fundamental place to start once you have that cracked you can work on the other bars. every sale but its the only way to make progress. In other words be prepared to spend likely 500 odd+ seasons slowly and methodically grinding out literally hundreds of thousands of horses.........if you can stand the tedium.